'The Surface of Last Scattering' is to become a film! My short story 'The Surface of Last Scattering', published last year in TRSF (a well-received original anthology commissioned by Technology Review) is being made into a short film. Needless to say, I'm over the moon about this. 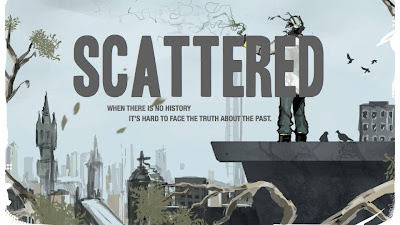 Scattered is the graduation project of MetFilm School students Joshua Bregman (writer-director) and Victoria Naumova (producer), and they've pulled together an impressive team of students and professionals to make the film and act in it. I'm seriously in awe of, and deeply grateful to, the kind of talent that's throwing itself into realising my story on screen. If you'd like to be a movie mogul - and let's face it, who wouldn't? - go to their fundraising site at IndieGoGo, contribute, and claim whatever amazing perk (which can include, as well as tangible mementoes and desirable treats, your name on the credits) matches your contribution. Now we just need to throw a few hundred million at Fall Revolution and Engines of Light. You know, for starters. Awesome! I agree on the Engines of Light.... Where are filthy rich SF fans when you need them? Engines of light would be better on TV. I've just re-read it again and is perhaps Kens easiest and most fun read.